“With striking honesty, sincerity and warmth,” said the judges, Grace Hawkes “reminds us that our neighbours are those who literally live in the homes next to us”. Who is my neighbour? Well, that is a very good question. Living in a dead end avenue, only five houses long, the mutual support around the street is a special feeling. I’ve got a small variety of people living around me, with different personalities. In my street some of the social statuses include the lonely Asian woman, the rich seniors at the corner, the humble old lady with a pristine garden, the elderly astute ex-doctor, the young chaps who just had a baby, and the caring Connor family who just moved in. Each and every one of my neighbours are great successes if I were a pirate, but the most treasured one of the lot is Beverly Shannon, previously referred to as the humble old lady with a pristine garden. Bev lives across the road and two houses down from us. Born in 1936, Bev is wise in her ways. Her beloved husband passed away several years ago; dealing with grief in her own way, Bev always puts on a smile and expresses a soft chuckle. She never had kids, so her kind niece comes to visit her often. Bev is reasonably short, considering she is shrinking with her age. She has wavy, grey hair, and chestnut brown eyes, deeper than a deep, brown whirlpool which surrounds her inky black pupils. Her hot breath seems like it needs a mint after her regular oaty porridge with honey. Even though Bev is getting to an old, forgetful stage of her life, she manages to remember everyone’s birthdays, and makes them feel loved on their wonderful day by delighting them with a special treat. Last year it was an Aldi brand of boxed chocolates, but this doesn’t bother me because it’s the thought that counts. Bev lives in a large, two-storey brick house opening up to the road. The bricks are burnt umber in colour, mixed with swatches of merlot. There are three grand windows on the second storey facing the street with big white wooden rims and a blue-ish tint of glass. Her verandah stretches from the door to the driveway, and is covered in cream pastel tiles, with a large vase of sweet pea orchids by the door. At the entry of the house there is a white, wooden arch spreading across the driveway. Fragrant crimson roses tangle and tumble around the top of the arch, fighting for the prime spot – where the sun’s rays reach the most. It really is tranquil at the peek of dawn, when you stand under the arch and a fresh rose petal falls into your hands, moon-kissed by the dew drops at night. Without a doubt, the most glorious part of Bev’s house lies behind the gates. Based on a traditional Japanese garden, Bev continues to landscape and uphold her mind-blowing precinct, laid out with fresh strips of buffalo grass, dotted with faded pebbles, and dashed with magnificent magnolia trees. The centrepiece of the garden is an intricate fish pond, with surrounding rocks hugged tightly by moss, a small brown metal bridge curving over the pond, and a dozen multi-coloured koi fish drifting around steadily, forming a hypnotising scene of relaxation. The resting koi fish are speckled with shimmering scales in gradient offshoots of colour. Various garden statues, a single pagoda and a cream flamingo, are placed neatly around the pond, producing a meaningful storyline. You can hear the peaceful humming of the birds high up in the protected chambers of the branches every day, when the mummy birds embellish their nests and tidy up, before daddy bird comes home with a well-deserved meal. There are also mischievous sounds which can be heard. The cheeky chatters of the lorikeets forming conspiracies to ambush the murder of crows when they come in for a feed. Those voracious beasts lurk around the shadows of the treetops, kidnapping the young hatchlings and destroying the nests. It’s currently springtime, and at Bev’s, the jittery fish jump around in the clear water of the pond, as the flower petals burst out of their buds and grow at a fast rate. There is an endless panorama of blooming colours, swaying in the caressing breezes which endure the sky. Today I was picking basil leaves from the small garden in our backyard, and I heard distressed murmurs from out on the street. I strolled down to the gate to see what on earth was going on, and each step I took, the horrifying murmurs were getting louder and louder. I opened the gate and stood out on the road, and right in front of me, was an elderly lady looking overwhelmed and worried. Little did I know that this lady is the astute ex-doctor’s wife. She kept repeating, “Daddy, daddy, where are you?” I didn’t want to frighten her during her fit, so I ran over to Bev’s house and informed her of the situation. As soon as Bev heard this, she instantly had a concerned look on her face, and I presumed that she knew her. Bev rushed out onto the road and comforted this poor lady, and stayed with her until the ambulance came. This brave and caring act Bev carried out reminded me of the good Samaritan act in the Gospel of Luke, in the New Testament, when the Samaritan saved a man’s life after he was mugged by robbers: the Samaritan rushed over, bandaged his wounds, and poured oil and wine on them. I later found out that her name is Joan and that she has Alzheimer’s disease, so she forgot where she was and why she was there. A few days later, the circumstances got worse, and she wasn’t eating or drinking. Then on the 14th of March, Joan sadly died. The emotions around the street were glum and dispirited for the next few days, especially Bev’s. Anyone in the street can mark my words, in that Beverly Shannon’s presence is one to cherish and reminisce on forever, as she is a kind-hearted, warm, loving elder, who is certainly hard to forget. I look forward to each day knowing that when I leave for school and come home from school, Bev will be slaving away at her garden, arched over and slowly turning to wave at me, with a weak but friendly grin. This event makes my day, every day, and the same goes for everyone else in the street. This article was awarded third place in The Good Oil 2017 Young Writers’ Award, secondary student Years 7 to 9 category. 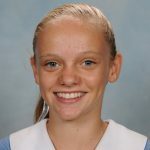 Grace Hawkes, age 13, is a student at Our Lady of Mercy College, Burraneer, in NSW. She is happiest when around animals and would like to be a vet one day. Grace loves going to the beach and is being out in the sunshine.